Raja Ampat Homestay Information Center. Help & information for homestay guests. Information Center staff wear the orange t-shirts shown at right. Blue shirts are worn by Waisai high school trainees. The Raja Ampat Homestay Information Center is located at the Waisai harbour and is open 7 days a week. It’s the place to go for any help you need regarding homestay accommodation. The Raja Ampat Homestay Information Center is also the place to go to if you don’t see someone holding a sign with your homestay’s name on it when you get off the ferry. In January 2018 the Waisai port authority decided to renovate the information center’s original premises. 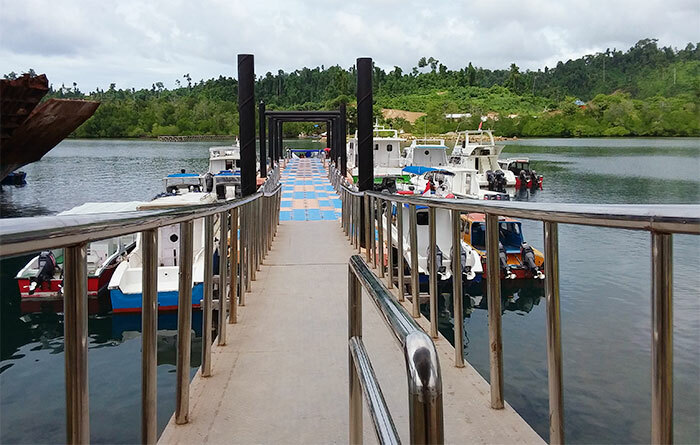 The temporary location is on the western side of the harbour, at the head of the ramp leading to the floating dock where homestay boats pickup guests. To reach the center’s temporary location, you need to walk around the outside of the construction site fence. The photo gallery above shows where to go. PLEASE NOTE: For everything to do with homestays, always talk to the Raja Ampat Homestay Information Center staff wearing the orange PERJAMPAT branded shirts, not to the staff at the Entry Permit sales counter on the left. Despite what you may be told, Entry Permit sales counter staff can not help you with homestay arrangements, and (unless you want to) there is never any need to go into Waisai town. See the photos and captions in the photo gallery above for help identifying Raja Ampat Homestay Information Center staff. 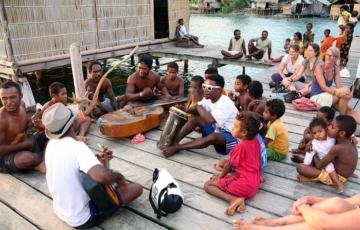 The information center is a Raja Ampat Homestay Association initiative that exists to serve the needs of homestay guests. If you are a homestay guest in Raja Ampat and have any kind of issue that you need assistance with, the information center number is the one to call. The Homestay Association welcomes feedback about your experience at the center and wants to hear any suggestions you may have. Please leave feedback below or via a private message on our contact page. 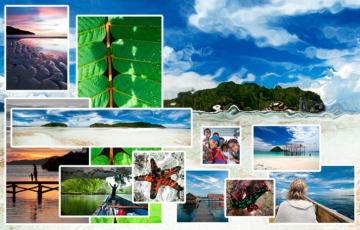 Many thanks for helping others by planning and booking their raja ampat trips. Very, very helpfull. Really appreciate this. Termia kasih banyak! Do you think the homestays/diving centre can and will accept payment via bank transfer? Yes – most homestays can accept payment by bank transfer, but you will need to speak with them directly to organise it. Do you know if ferry boat is operating during chinese new year , feb 5 from waisai to Sorong ? We have not heard that it won’t, so we assume that yes – it will be running, Supito. Is this worth trying again? What should I do next? Unfortunately, the issue at Yenkoranu is more organisational than technical. (“Victims of their own success” it would seem!) All we can suggest is that you keep trying, or pick a different homestay. FYI, most users report more (eventual) success via the site booking forms than by direct contact. Unfortunately, Raja Ampat Diva has been temporarily removed from the website because of this. Hopefully they will fix the problem soon and will return. We can either let you know when that happens, or if you prefer, you can send your review and whatever star rating you’d like to award them to our contact page, and we’ll post it for you when they are returned. Information center staff won’t see your comment here. You need to either contact Otter directly, or call in at the Information Center when you arrive. I’d like information on the possibility of last minute accommodations in Raja Ampat. When I call the Information Center I get a busy signal or a message that the call cannot be completed. Is it common to arrive in Wasai without an accommodation booked in advance? Is there a risk that there won’t be any availability? Arriving without bookings is quite common, and there’s no chance at all that everywhere will be full. As long as you don’t want to stay at the most popular homestays (or anywhere on Kri during peak season) you can find homestay accommodation at any time of year. We’ll check what’s happening with that number, but the center is staffed every day at ferry arrival times, so just drop in if you can’t contact them beforehand. could anyone suggest where to leave the cash money you need to bring to the islands when you go (for example) diving aor for a walk? We always keep our cash on us in a small shoulder bag that also has our phones, cameras etc. When diving or snorkelling we leave the bag in the boat. In 7 years of doing this, we have never had a problem. Hello, we are planning a trip at the end of October/begin November. We like to start from Wasai and want to end in Misool, from there we want to take the boat to Seram (I heard Bula?). Does anyone knows the timeschedule of the boat, how long, what time, what day? Unfortunately, the Pelni shipping company website is terrible. They don’t publish schedules more than 2 months in advance, and you can only search for routes if you know the names of the ports you are going from and to. 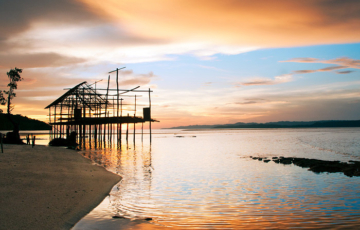 You will have to pass back through Sorong anyway, so we’d suggest talking to John Urbon. A member of our Raja Ampat Travellers’ Forum on facebook may have this information too. You’re welcome to join and ask there if you want to. I know that there is a problem with Internet and telephone connections in Raja Ampat. Is there any cellular network that you can recommend? which works, for example, on KRI? You’ll find all that information here Arek. Is there still a problem with internet and telephone? i try to reach kajak4conservation but i don’t receive any news! No current communication issues on Kri as far as we know, Michele. we are Simone and Sara, we are planning to be arrive in Sorong at 6.30 am, is it possible take the ferry of 9.00 with this timing? once in Waisai can we book easily a homestay and be there the same evening? Arriving in Sorong at 0630 will give you plenty of time to make the 0900 ferry. As long as you don’t want to stay at one of the more popular homestays, then yes – you’ll be able to arrange accommodation once there. You may have to wait a few hours for a pickup though. Booking in advance will avoid both of those issues. Hi, I am trying to get the cost of a boat transfer from Beserbay Homestay to Rufus Homestay, and then from Rufus over to Dayan Homestay on Batanta Island…have emailed them but so far have no reply…I realise that much or Raja has little telecommunications…was given this email address in hope that you may be able to help me! It’s unlikely that the Information Center staff will see a comment left here. You need to contact them directly by email or phone as provided above. I am looking for homestay availability for two places, Batu Lima and Yenanas Paradise, both in Eastern Gam. They do not have email contacts on the stayrajaampat website. I was wondering if you can do me a favour and find out the following for me. 1. I am a single traveler. Do you have available rooms (private bungalows on beach) from February 18 to 22? 2. For the dates above, if the homestays have other guests booked for the same dates so i can share boat cost for day trips (snorkeling). 3. If i arrive in Waisai on February 18 (Sunday) around 11am, is it possible for the homestay to arrange transfer pick up? It’s extremely unlikely that Peter will see a message left here. If you want to ask the Information Center to do this for you, it would be best to contact them directly by one of the 2 methods provided above. We are 3 man and we would like to stay at yenkoranu homestay for 3 to 4 nights..we will arrive to sorong at 6.25 on 26.2.2018 and we would like to take a 9.00 ferry. We would like to have triple bed bungalow or 3 rooms..or something else that we can fit in and have separate beds. It is posible to make reservation here? If you want to request a booking for 3 separate rooms you can easily do that using the booking form provided on Yenkoranu’s page. If you want to find out if it’s possible to have 3 separate beds in a single room, then you will need to contact Yenkoranu to ask. Contact details are provided at the foot of Yenkoranu’s page.